Summer is almost over but in a country where we have really nice beaches, it might as well be summer all year round. But our oceans are now choking in plastic. Heard of the Great Pacific Garbage Patch? It’s an accumulation of ocean plastic and garbage, which to date, is three times the size of France, and it’s getting bigger! Why don’t we just clean it up? Not as easy as it sounds. There’s the issue of cost, distance, and effects of photodegradation (sunlight reducing plastic to smaller bits making them even more difficult to clean up). Plastic is deemed evil for a reason (i.e. toxicity, pollution, etc.) but its usefulness in terms of food safety and food preservation is undeniable. A Quartz article explains that “Plastic is the symptom. Our centralized food system is the disease.” And a systemic issue will take time to be resolved. One thing we can already do, however, is to start getting rid of unnecessary plastic. The good thing is more and more people are becoming aware of this. A lot of efforts are now being done to tackle the challenge. There’s the ban of single-use plastic in some cities and municipalities, even among corporations. 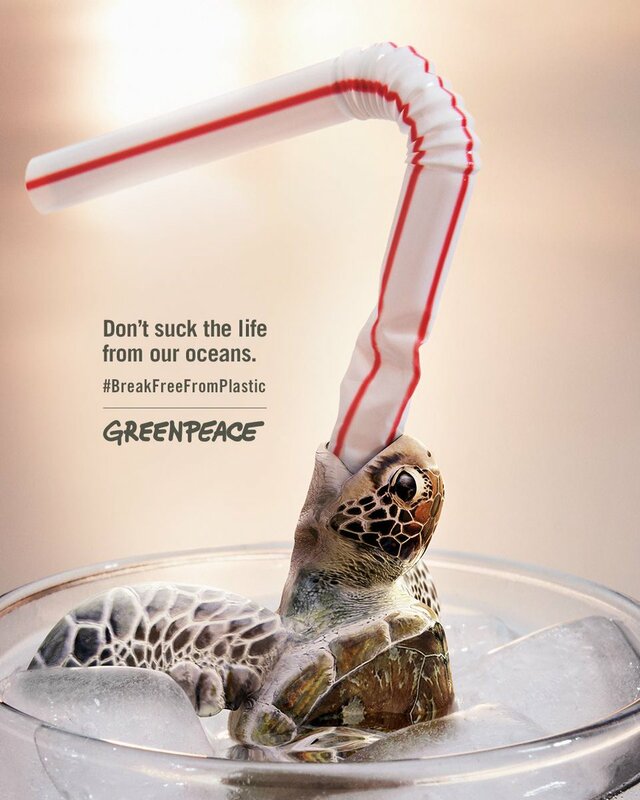 People are refusing straws and are opting for better alternatives – paper straws, bamboo straws, metal straws, and glass straws. There’s even a collapsible and seaweed-based edible straw. Speaking of edible, an alternative plastic bag made from cassava can be eaten or is compostable (as opposed to the oxo-degradable bags which just break down into micro plastics). A growing group of individuals are starting to adopt a zero-waste lifestyle bringing re-usable bags, and jars, and containers when they go shopping; and re-filling their re-usable water drinking bottles instead of buying bottled water. We have all these better options and it’s such a simple decision to make. It’s a matter of saying yes to the simple solution with big impact and letting go of the attraction of convenience. Halo-halo in the mountains with a re-usable container. It’s silly but I actually dreamt about this. I requested that my drink be served without a straw. My drink arrived with a freakin’ plastic straw! I wake up and the same thing happens in my waking world. Geez, just remove the straw then, what’s the big deal? Well, we’re unnecessarily creating waste which could have been avoided at the very beginning. It’s recycled anyway? Only 10% of plastic produced globally is recyled. Most of it is trashed and ends up in the ocean forming the Great Pacific garbage patch, a collection of marine debris mostly plastic. We create biodegradable plastics but they don’t readily decompose and some become tiny bits also known as microplastics. January is the Zero Waste Month in the Philippines and I wish we could channel even a little of Lauren Singer’s effort in striving for a zero waste lifestyle. Or maybe we should start segregating our wastes into 34 categories like the town of Kamikatsu in Japan. But really, segregating wastes into biodegradable and non-biodegradable could already make a difference. Garbage dumped in landfills can significantly be reduced if the biodegradables are composted. We used to have just one garbage bin in the office. I felt bad whenever I see the garbage all mixed up. After work, when I leave the building, I see these piles of garbage bags and these men sorting through the waste, probably looking for recyclables they could salvage and sell. Again, segregating wastes into biodegradable and non-biodegradable would make life easier for them. So that’s what I proposed and I’m glad people in the office obliged. I didn’t want to impose too much. Waste segregation is very basic but you would be surprised how it can get complicated. We don’t exactly have a proper system for waste management. We have the policy in place but lack the political will to fully implement it. And there are much more important things to think about. Heck, environmental issues should be prioritized and addressed but that’s just me. In a developing country like the Philippines, where poverty is still pretty much part of life, how can you ask people to avoid single use sachet contributing to plastic pollution when that’s what they can afford. Same with patronizing organic food or sustainable and environment-friendly products, which are relatively more expensive. My friends and I were talking about this one time, relating it to Maslow’s Hierarchy of Needs. If people can barely satisfy their basic needs, you can’t expect them to care for the plight of the environment. On the other hand, why do smart, caring people ignore environmental issues? Why can’t those who can take action? At the beginning of this year, I wrote “Note to Self” to remind myself to breathe and let go. But as an environmentalist, sometimes I can’t help feeling frustrated. The more you know, the more you care, the more you suffer. You’re labeled anti-development. Or they think you’re just exaggerating or over reacting. Add to that the fact that environmental defenders are being killed! Why did I decide to be an environmentalist, haha! Because as Helen Keller puts it, “I am only one. I cannot do everything, but still I can do something; and because I cannot do everything, I will not refuse to do something that I can do.” I guess, that’s one thing I can do. Raise awareness through my writing, through the environmental initiatives I participate in, through my lifestyle. Author Ryan BestrePosted on January 20, 2018 January 20, 2018 Categories environment, philippinesTags garbage, plastic, pollution, zero waste10 Comments on No Straw! No Straw! Baguio has recently been designated as one of the UNESCO Creative Cities for crafts and folk art. While this calls for a celebration, I can’t help but think about the issues haunting my beloved hometown. Baguio is no longer the City of Pines. The trees have been replaced by malls, tall buildings, and condos. Are we trying to copy Manila? Manila of all places! Remember how trees were cut to make way for a “green” Sky Park that features environment-friendly facilities. Really?! How smart! Very, very smart, indeed! I’ve joined a protest walk to stop this madness but sadly, corporate greed prevailed. In a funny twist of fate, the mall’s roof was blown away by a typhoon, not once but twice! Now comes another “brilliant” proposal of constructing a podium car parking at Burnham Park. Baguio is no longer the “Clean and Green City Hall of Famer” it used to be. The city is choking. Choking in smoke, garbage, and plastic. There’s an ordinance that bans plastic and Styrofoam. I understand that this is yet to be fully implemented next year but when I was in town the past weekend, it seems like there’s not even an attempt to transition to eco-friendly bags. Baguio is no longer the Summer Capital of the Philippines that we knew. This title, in fact, has been abused to justify putting up more hotels, more establishments, more cafes. Apparently, there’s almost a hundred registered cafes in the city! Far too many of everything if you ask me. Blame doesn’t only fall on big corporations, businessmen, and realtors. Baguio residents have allowed the invasion of houses on mountains which appear nice at night but look like garbage piled on top of each other at daytime. It’s easy for us to put the fault on tourists for garbage and too much traffic but we also contributed to these. Sigh… the rant just goes on. I woke up thinking how using the AC demands more electricity which primarily is sourced from coal thereby contributing to carbon emissions hastening climate change. But William McDonough and Michael Braungart’s book, “The Upcycle” claims that this is more of a design rather than an environmental problem. If the energy comes from a renewable source, then you don’t have to feel guilty about enjoying the comfort provided by an air-conditioned room. Same thing with taking a long shower. Nothing wrong with that if the water is recycled. And this applies to products which don’t necessarily have to end up as trash if they follow the cradle to cradle concept, a holistic and waste-free way of manufacturing. While reading this fascinating book in the bus, I can’t help but shake my head and wonder how difficult it is to pocket the tiny bus ticket that people put more effort in stuffing it in corners and crannies. Don’t get me started on the supposed inspection of these bus tickets. We do know there’s a better system and is already existing at that. Another design flaw. Would it make a difference if I confront them? I once did that in the jeepney when this full grown, obviously educated woman, just mindlessly threw the garbage on the floor and I told her, “That’s not the garbage bin.” She just looked at me innocently as if she didn’t do anything. And that’s what I end up doing when encountering such individuals. Stare at them spitefully and they stare back confused wondering what they did wrong. Littering is bad and everybody knows it but we’re just too lazy to care, that is, if we care at all. Speaking of trash, another frustration I have is with straws and plastics. When you say, “No straw/no plastic, please” vendors or servers sometimes find that amusing. I was told, “Remove the straw yourself.” So when I see my friends using straws, I judge them, a little. I observed that for most people, these things are not a big deal. How about health? We know that fastfood, processed food, and too much meat is bad news. Bad for the environment, too. But it doesn’t matter. It’s what’s available, it’s cheap, and they taste so good, as well. I still eat fastfood sometimes because it’s that convenient. And real food is difficult to come buy these days. I was a pescatarian for a while wanting to be a vegetarian but options can be very limiting. Add to that the idea of micro plastics in my fish and pesticides in my veggies. Besides, according to “The Upcycle,” we should celebrate diversity and that includes diversity in diet. So right now, being a flexitarian is the best option for me. I don’t know if it’s just a trend but more and more people are turning to organics, and healthy living, and being more mindful and more sustainable in their ways. This is the right thing to do but who am I to tell people how to live their lives. As zero waste advocate Lauren Singer puts it, what environmentalists can do is to show everyone that there are other better options. I remember the quote from Inception: “An idea is like a virus. Resilient. Highly contagious. And even the smallest seed of an idea can grow.” So I guess my goal, since it’s Environment Month and all, is to plant seeds of green ideas and hope that these would grow in the minds of people. Because the truth is (and this is not some kind of an alternative fact), environmentalism, this seemingly hopeless idealism, is for humanity’s survival.